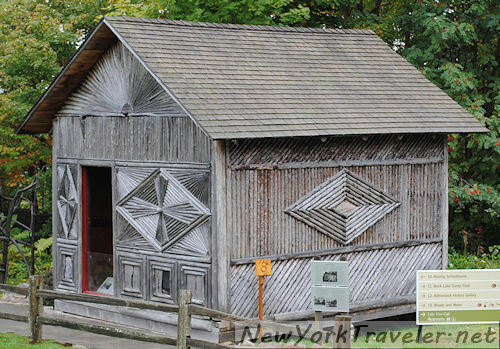 This is one of the finest museums in Upstate New York. Read Part 1 of our trip. 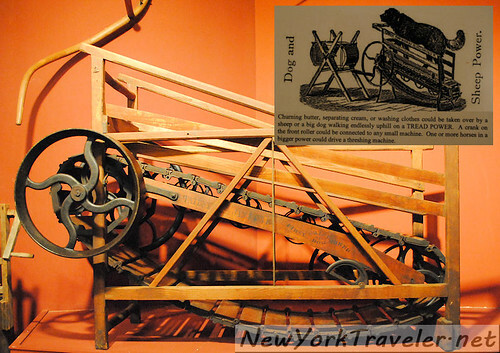 The Adirondack Museum is the “everything” place about the Adirondacks: the ecosystems and biology of the forest and lakes; life in the Adirondacks from early times to now; the logging and mining industries; its formation as a state park system; a treasure trove of Adirondack paraphernalia. It took us two days to see the entire museum, and we rushed through it on the second day! The place is situated like a campus, with dozens of outbuildings connected by pathways. Lovely fountains, a pond, and breathtaking views of the majestic mountains fill the background. 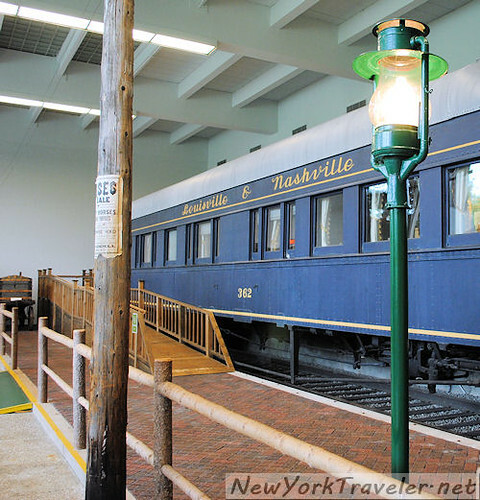 After wandering through several buildings loaded with information and artifacts relating to the geology and geography of the park, boat building, and Adirondack camp nostalgia from the previous century, we entered an enormous building with several life-like displays of old carriages, trains, and sleds. Transportation by boat seemed to be the main mode for Daks residents, but a railroad and horse-drawn carriages transported visitors to the park. The train reconstruction is remarkable. What elegance and decoration of those old trains! Today, everything is so utilitarian; the difference is so striking. I like the Peddler Wagon. 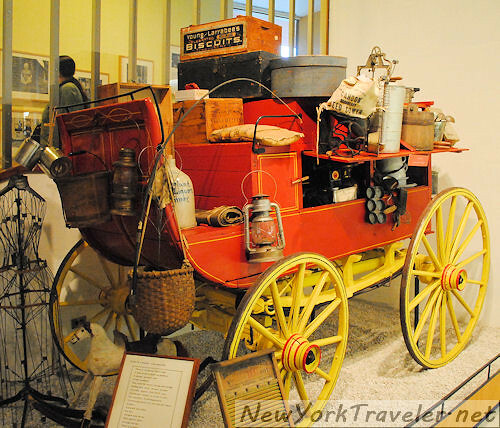 It was crammed with all the typical household necessaries of mid-19th century rural American. We also saw a Dog/Sheep Power Machine! The kids and I have often joked about building one of these. We wouldn’t churn butter as this one does, but maybe the critter would provide some juice for the electronics, eh? 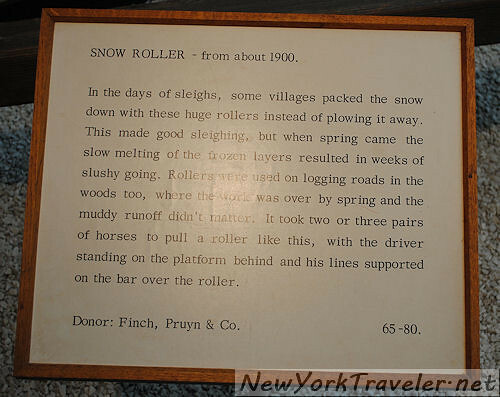 This is cool– a huge snow roller. Back before plows, all the people could do was squash the snow and pack it down as much as possible. Wow. I enjoyed seeing a replica of an old plank road. About 100 years ago, such a road ran in front of my house. These plank roads were built of logs. Sometimes the logs were planed flat, others kept there round shape and we firmly planted into the dirt pathways. VERY bumpy going. A businessman or group of businesses usually funded the construction. They charged tolls to make up for the construction costs. 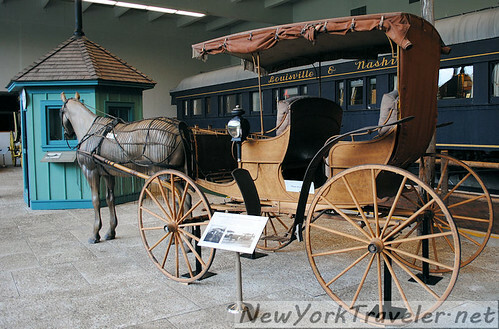 These roads must have been extremely hard on the wagon riders — ouch! 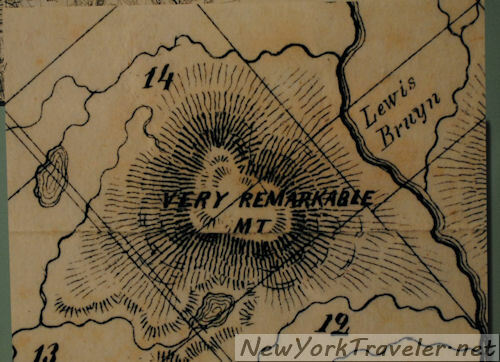 The name of this “mountain” on a map made me giggle. We followed another path from that building to several outbuildings. These were tiny replications of typical summer camps. This one is called the Durant Sunset Cottage, named for the builder and owner (William West Durant and Frederick Clark Durant, respectively) and for the radiant design. The building is sided by spruce limb and used as sleeping quarters for the Durant camp north of Raquette Lake. In the 1860s after the Civil War, Americans became prosperous and enjoyed more leisure time. City-dwellers and rich folks wanted to enjoy the “strenuous life” outdoors, and they flocked to the Daks for their exploits. 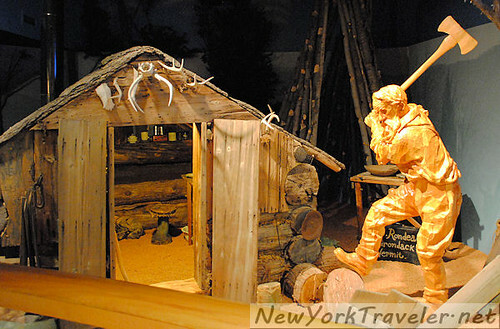 The Adirondacks are extremely rugged country, however, even to this day. A whole new economy sprang up: guides and guide books who led intrepid city slickers on forested adventures. Hermits came to the Daks, too. The museum dedicated a portion of the room to some of the hermits. Noah John Rondeau is one of the more famous hermits (oxymoron??). For a hermit, he sure got out a lot. He had visitors from all over the world, and traveled to New York City on occasion to give speeches about hermit living. Rondeau was quite the character. I have intentions of reading more about him (yes, he even had books written about him– this is quite the popular hermit!). 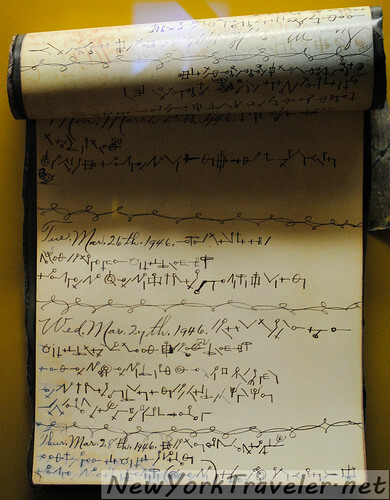 He invented his own language and wrote his diary in it. It took a while, but someone did crack the code. Rondeau was definitely a quirky character. One of the books at the museum that interested me was written by Maitland de Sormo. I’m going to check it out (it’s difficult to find in print anymore) and perhaps do a little story about Rondeau here in the future. 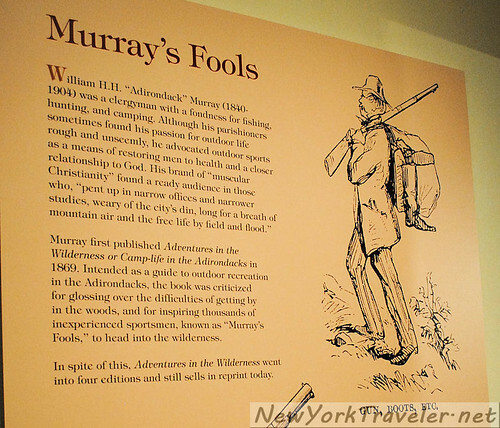 I continue our adventure at the Adirondack Museum in Part 3, so stay tuned for more!